Johannesburg & Pretoria – Last month, the Jesuit Refugee Service (JRS) South Africa celebrated the graduation of 221 refugees and asylum seekers from the Arrupe Women’s Skill Centre and Pretoria Skill Centre. The graduating women and men completed five months of training in their chosen disciplines and received materials to start up their own businesses. Their courses of study included sewing, baking, cosmetology, make-up application, hairdressing, computer literacy, and English. 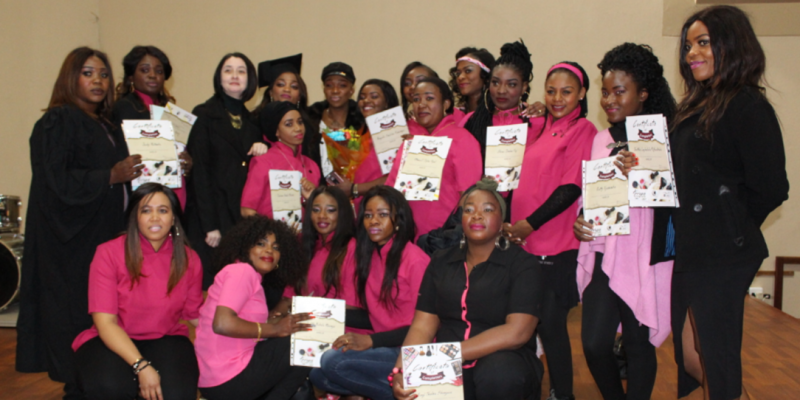 The Arrupe Women’s Skill Centre graduation was a joyful celebration. More than 100 graduates excitedly cheered for one another, danced, and received their certificates with proud smiles and expressions of gratitude toward God, JRS, and their teachers. “Before coming to the Arrupe Center, I did not speak English. Now I can support myself and I leave here with confidence,” said one student speaker from the English class. Another student from the baking class shared that “In addition to our baking skills, we are empowered by knowledge of business management to generate income for our families.” There was a sense of hope and ambition amongst the students to apply their new skills and support themselves and their families. At the Pretoria Skill Centre graduation, the energy of celebration was in the air. The sewing students modeled their work, including a wedding dress and bridesmaid’s gown. Many of the graduates shared their sentiments of gratitude and determination. “Thank you for giving us this opportunity, for giving us hope. When we came here our lives didn’t have any direction, but now we have a way to go,” said one computer skills student. These women and men will go into their community armed with the skills, materials, and newfound confidence to achieve financial self-reliance.